With all of the new Star Wars additions at Disney’s Hollywood Studios, now is a great time to be a Star Wars fan visiting Walt Disney World in Orlando. However, if you are going to Disney World with a young Star Wars fan between the ages of 4 and 12, there’s one attraction that you absolutely must do. That attraction is Jedi Training Academy: Trials of the Temple at Disney’s Hollywood Studios. Located on a small stage next to Star Tours, this 20 minute show lets young Padawans don a Jedi robe, wield a lightsaber, and face off against some of the baddest villains in Star Wars history. Basically, it’s an attraction that lets kids live out their Star Wars fantasies, and something that I really wish was around when I was a kid. If you are visiting WDW with a child who is all about BB-8, Rey, Luke, or Obi Wan, you simply have to make getting them into Jedi Training Academy part of your Disney World plan. Luckily, the admissions process is simply on a first come, first served basis. 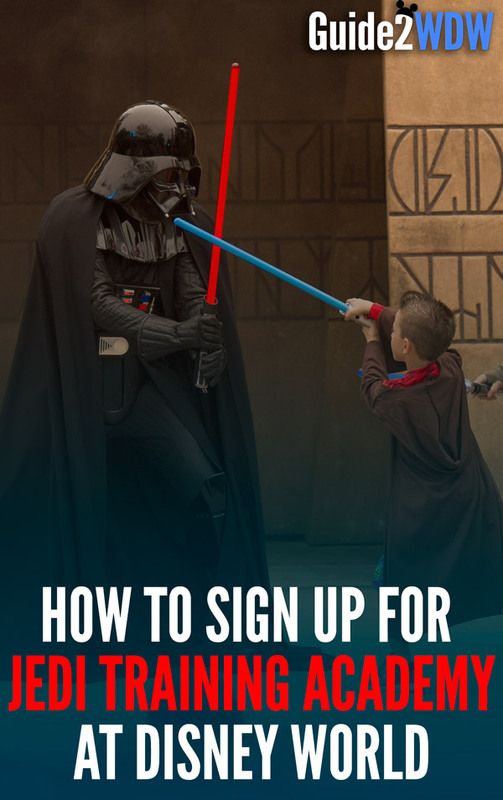 Here is our step-by-step guide on how to sign up for Jedi Training Academy: Trials of the Temple. Get to Disney’s Hollywood Studios as early as possible. There are a limited number of slots for Jedi Training Academy: Trials of the Temple, and sign ups are on a first come, first served basis. Sign-ups start at the beginning of park opening (including Extra Magic Hours days), and they typically fill up within the first 45 minutes to an hour of the park being open. Make sure you have everyone who wants to sign up with you. Kids between the ages of 4 – 12 must be present during the sign up process. Head straight to Indiana Jones Adventure Outpost. Once the park opens, head down Hollywood Boulevard and veer to the left towards Echo Lake. The sign ups for Jedi Training Academy are located at the Indiana Jones Adventure Outpost, which is a small shop in-between 50s Prime Time Cafe and the Indiana Jones Epic Stunt Spectacular. Sign Up and get an Assigned Time. If you are among the first to sign up, the cast member will give you an assigned time for the show. Show up 5 minutes early for your assigned time. Once you have your assigned show, go enjoy the park, but remember to head over to the ABC Sound Studio (Near the Jedi Training Academy Stage) before your assigned show starts. We recommend trying to get there at least 5 minutes early. Who knew becoming a Jedi is as simple as that! May the Force Be With You. James is a lifelong Disney Parks fan. While at the parks, he loves finding new details, learning more about Disney World history, and taking pictures. His favorite WDW attractions include Spaceship Earth, Tower of Terror, and Star Tours. James is a filmmaker and writer based in Los Angeles.